As the 21st century moves forward, many traditional ways of getting things done have been supplanted by the recent surge in on-demand solutions. Uber and Lyft are challenging the taxi industry, Apple Music and Spotify are disrupting the music industry, and now, SproutsIO has its sights set on revolutionizing the gardening industry. 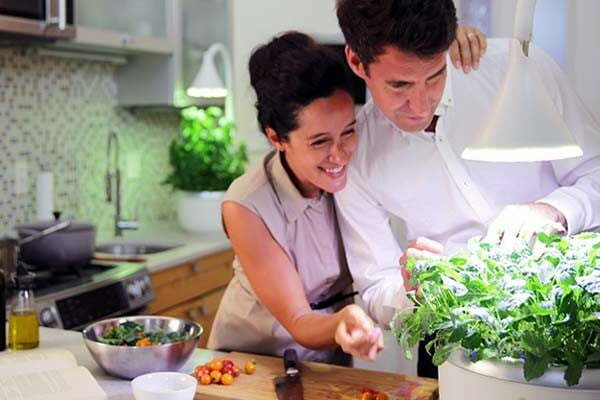 Recently launched via the popular crowdfunding site Kickstarter, SproutsIO reimagines the at-home garden by ditching soil while still offering owners the ability to grow fresh fruits and vegetables year-round. Even better, those without a particularly green thumb won’t find it difficult to produce fresh greens as SproutsIO is built for anyone to use. Originally developed by Jennifer Broutin Farah at MIT’s Media Lab back in 2011, the team behind SproutsIO (including Farah, who is the company’s founder and CEO) decided to refine the initial concept prior to seeking crowdfunding support. Operating with a focus on connecting people with the food they consume, and connecting them to the place where it’s produced, the brand wanted to find a way to allow people to enjoy growing their own fruits and vegetables and to make it easy. After years of research, the company developed an intelligent hybrid hydroculture gardening system that literally just needs to be plugged in to start working. So what can you grow? According to the Kickstarter campaign, SproutsIO lets anyone grow basil, Lacinato kale, parsley and cilantro, arugula, Tiny Tim tomatoes, and much more. In just three weeks, the device allows users to grow roughly 18 servings of leafy greens wherever the machine is set up. Furthermore, maintenance of the produce requires watering just once a month and is ready to eat as soon as it is harvested — no rinsing necessary. As of this writing, early bird versions of the SproutIO are available to early adopters at a special price of just $559, while it figures to retail for around $799 once the campaign concludes. With 28 crowdfunding days remaining, the innovative device had already raised $23,282 of its $100,000 goal.